Kohler Veil Intelligent Toilet Review - Is It Worth The Money? Are you looking for a luxury toilet for your bathroom? There are many toilets on the market that appear to do everything from flush, wash, heat, rinse, dry and everything in between. Most of these features are at the touch of a button and some are automatic too. Of course, when you want all the latest mod cons in your home, they can come at a hefty price. That is why it is important to find the right luxury toilet for your bathroom. We hope that this Kohler Veil Intelligent Toilet review will give you enough information to decide whether this modern toilet is worth its price. We will check out its design, features and compare it to a similar luxury toilet from a leading brand. Without further ado, lets see how intelligent this toilet really is. 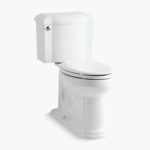 The Kohler Veil K-5401-0 is a skirted, one-piece, elongated toilet with a distinctively modern feel to it. Its simple egg like shape would not look out of place in a Sci-Fi movie, however its simplicity also adds to its style. I really like how smooth the curves are because keeping this toilet clean could not be easier. There are no crevices or lines for bacteria and grime to accumulate. Just a regular wipe with a damp cloth should take no more than a minute and keep this toilet looking brand new for years. Of course the style of a toilet is a personal choice and for sure this one doesn’t look anything like a standard model. No more slamming of toilet lids. A slow close lid will slowly and quietly close with the slightest of touches. 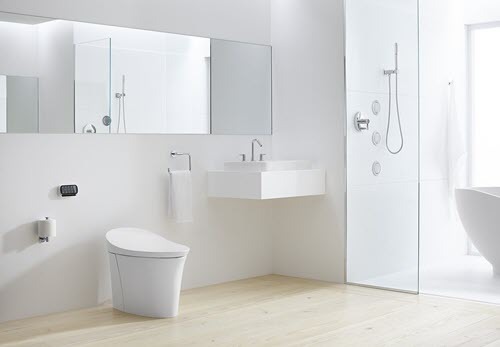 This compact, streamlined toilet looks great but it is its features that make it stand out. Lets see what they are. A stainless steel bidet wand offers an adjustable spray shape, with a choice of positions, water pressures and temperatures. You can even choose pulsating and oscillating water functions. If you have never experienced a bidet before, then you are in for a treat with this feature. Also, there is a option to wash the front and rear. It has a self-cleaning function that uses UV light and electrolyzed water systems to clean and sanitize the wand surface. This is great for keeping this area hygienic, so that you don’t have to clean it. If the water spray wasn’t enough, there is also a warm-air drying system to finish the job. This is truly a hands free toilet. The warm-air dryer has a temperature control system to heat the air to your preference. And to top it all off, the toilet automatically releases a deodorizer while the toilet is in use. Just like the warm air can be heat adjusted, so can the toilet seat. So if you want to heat the toilet seat in the winter months, then you can adjust the settings to your desired temperature. Not only that but one of my favorite features is the ability to open and close the seat and cover…hands-free. They are motion-activated so you won’t have to touch the toilet seat and lid when you want to open them. This handy little feature is very useful when there are power outages. This toilet needs electricity to work, so if there is a power outage at the wrong time, you could have been left with a non-flushing toilet. Fortunately, not with the Kohler Veil. This intelligent toilet has an emergency flush feature to take care of business when there is an electricity outage. Finally, the Kohler Veil has LED lighting that will illuminate in the dark. A simple feature that will serve as a night-light when you don’t want to turn on the bathroom light in the middle of the night. Some of these features are automatic and hands-free, however some things will have to be controlled by you. This is why an LCD touchscreen remote control is included. Of course, the Kohler Veil is a dual flush toilet, allowing you to use a partial or full flush. A partial flush is 0.8 gallons per flush and a full flush is 1.28 GPF. Both of these flushes are WaterSense certified, so there will be a lot of water saved using this toilet. Another great feature is that it will flush once you step away from the toilet. No matter if you used the toilet standing up or sitting down, it will still automatically flush. It will take around 10 seconds for the unit to flush, so it gives you enough time to slow close the toilet seat if you wish. However, this toilet will close the lid automatically within around 30 seconds. I can’t say that this toilet is quiet, however this may be because it is so powerful. This toilet won’t clog and you won’t have to flush twice. Which leads me to the flow requirements necessary to use this toilet. A minimum water supply flow rate of 9.0 gallons per minute or 1.5 gallons in 10 seconds must be confirmed before installing. This is necessary for an optimum flushing performance. Some features will need electricity to function, so will need to be installed near an electrical outlet. Therefore, you may need to hire an electrician to install the toilet. Other than that, there is not a big difference installing this one compared to installing a regular toilet. The extra knowledge needed is testing the water pressure. This toilet uses a standard 12″ rough-in. To compare this toilet to a suitable competitor, it had to be a luxury, smart, compact toilet with a lot of cool features. It was an easy one to find. The toilet I chose to compare is the TOTO Neorest 700H. Lets see how it fairs against this intelligent toilet. As I said earlier, the Kohler Veil wouldn’t look out of place on a Sci-Fi movie. Well, the TOTO Neorest 700H is no different. Both of these toilets look awesome and will add a lot of style to your bathroom. The TOTO Neorest is ADA Compliant and Universal Height, where as I am uncertain about this specific Kohler Veil model. It measures just over 17″ from floor to seat which does make it Comfort Height, however Amazon or Kohler do not state that this specific model is ADA Compliant. Both toilets are powerful and extremely efficient and are WaterSense certified. They are also dual flush toilets. The Kohler Veil has a partial flush of 0.8 GPF and a 1.28 gallon full flush. 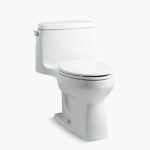 However, the TOTO Neorest is a little more efficient with a partial flush of 0.8 GPF but a 1.0 gallon full flush. These two toilets are highly efficient and they certainly do not lack in power. Since both these models are intelligent/smart toilets, there are many features that you would expect them to have. As I listed the Kohler Veil features above, it would be better for me to list any features that the Neorest has or has not, compared to the Veil. The TOTO Neorest uses its very own ewater+ technology to clean the bidet wand and toilet bowl. Why do you need this? Bacteria and waste can accumulate in certain areas of the toilet, creating permanent stains. The environmental friendly ewater+ uses no chemicals or cleaning agents to automatically keep your toilet looking brand new. However, the Kohler Veil does use UV light and electrolyzed water to sanitize the wand surfaces. Also, the Neorest has three bidet wash modes (front, rear and soft), where as the Veil has only two wash modes (front and rear). I may be nit picking there, but other than that there doesn’t appear to be any differences when it comes to features. Up until now both toilets have been quite similar. Not too much between them. Except for the price. There appears to be quite a large difference in price. At the time of writing, the Neorest was a lot more expensive compared to the veil. I can’t really put my finger on it because they both seem quite similar. Maybe the Kohler Veil is just a more budget friendly luxury toilet (still pricey though). The Kohler Veil is expensive but still a lot cheaper than the TOTO Neorest 700H. Well, this one is quite easy to decide. Both toilets have similar features but one is a lot more expensive. Just because of the far cheaper price, the Kohler Veil intelligent toilet is my preferred choice. If you would like to see a more detailed review of the TOTO Neorest 700H, then follow the link. The Kohler Veil is a luxury smart toilet designed to make your bathroom experience as pleasurable as possible. With too many features to mention, this compact toilet makes using a toilet an almost completely hands-free. When it comes to luxury, the Kohler Veil is a superb option. The Kohler Veil is a luxury toilet with a lot of great features. It is almost a hands-free toilet with many automated features that will make using the toilet such a pleasure. I hope you have found this Kohler Veil Intelligent Toilet Review helpful and you now have a better idea if this luxury model is worth the hefty price tag. If you have used the Kohler Veil or the TOTO Neorest before, let us know what you think of it and whether these luxury toilets are worth buying.